The August jobs report was stronger than expected as payrolls bounced back from a significant July decline. Canada’s economy added 26,000 jobs last month (a 0.1% gain), thanks to large gains in the public sector and increased payrolls in Quebec. The rebound followed a disappointing July report where the economy shed 31,200 positions, with big losses in full-time employment. The unemployment rate rose a tenth of a percentage point to 7.0%, as more people entered the labour force. Over the past year, employment increased by 77,000 (0.4%), but reflecting the weakness in the economy, especially in the oil sector, all of the gains in the past twelve months were in part-time work. Over the same period, the total number of hours worked fell by 0.4%. Another troubling sign was that employment was down in August among the primary workforce, people aged 25 to 54, although job gains were posted for younger and older workers. Nevertheless, the jobless rate for younger workers remained high at 13.2%, as more youths entered the labour force. For older workers, aged 55 and older, employment rose by 29,000 last month with gains for both men and women, but the unemployment rate was stable at 6.0%. The “lost men” phenomenon is showing up in Canada, as it is prevalent in the US where the number of men aged 25 to 54 in the labour force has declined precipitously–estimated at about 7-to-10 million men in the US who are not working or seeking work. This has led to an unprecedented decline in the labour force participation rate of men. In Canada, employment among people aged 25 to 54 decreased by 25,000 in August, virtually all of which was among men, as their jobless rate increased 0.3 percentage points to 6.6%. There are many theories about why this is happening. For one, the weaker sectors of the economy–goods production (especially oil) and construction (weaker in the US than in Canada)–are dominated by male employment. Many of these lost workers are less educated. On a geographical basis, employment rose in Quebec and Newfoundland, while it declined in New Brunswick. For all of the other provinces, there was little change in payrolls. Public sector jobs increased in August, while self-employment fell and the number of private sector employees was roughly unchanged. Job declines were posted in professional, scientific and technical services. Bottom Line: Canada’s economy has been pummeled by the decline in the oil sector and the modest growth in manufacturing and service employment. While we are optimistic about a substantial growth rebound in the second half of this year continuing into 2017, lingering pain is evident. The brightest spot in the economy has been housing in Vancouver and Toronto, but that has boosted household imbalances and over-extended many first-time homebuyers, leaving us vulnerable to financial instability in the future. 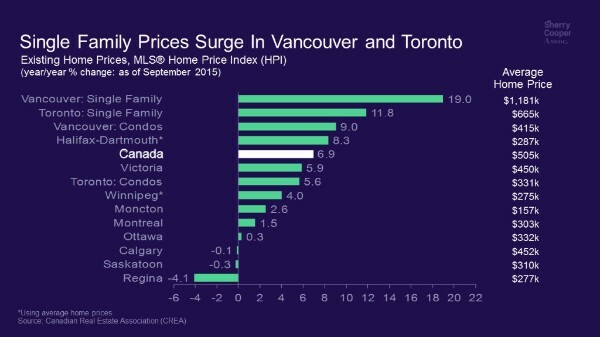 Preliminary evidence suggests that housing may now be slowing markedly in Vancouver.